With fall on its way, there are cooler temperatures, leaves falling, and much more to account for. Olathe landscaping means managing four seasons. So it’s important to note the changes in the season and how this could affect your property. There comes a time every fall where the leaves look beautiful as they fall. Often, the leaves look so stunning, you don’t want to rake them. You must rake them. Not only do leaves not help your greens, but they can also cover up walkways and leave your property ripe for an accident. As the growth and green of your lawn slow down in the fall, that doesn’t mean you neglect it during this time. You need to be preparing your lawn for winter and the spring. By properly fertilizing your lawn during the fall, you’ll be less likely to suffer significant landscaping damage during the harsh winter. 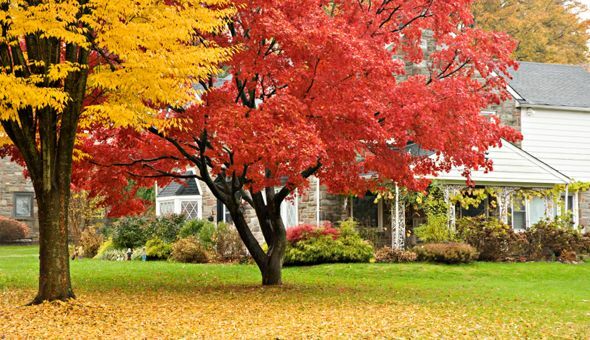 As alluded to earlier, fall is the time to prepare your landscape for spring. One easy way to do so is through planting spring bulbs. When spring rolls around, you’ll find colorful blooms in your garden – if you take advantage of the fall. Just make sure to plant them low enough in the dirt, so they don’t freeze. Many see fall as the season where all the colors in your yard die. It doesn’t have to be this way. Instead of ignoring colorful options this fall, try adding different mulches in a number of hues around your garden and trees. You can also add strong green hedge plants that will last through the winter during fall. Once it gets too cold, many pool owners think pool maintenance season is over. It’s not! Even during the fall and harsh winter months where you wouldn’t dream of entering your pool, you still need to keep chemicals balanced and a weekly cleaning schedule. As you wind up the landscaping season this fall, remember to take care of your tools. Clean off all debris and dirt before you properly store them for the winter. If you fail to do so, you’ll find some of your old tools unusable when you’re ready to start using them in the spring. Finally, if you’re looking to improve upon your Olathe landscaping this fall, try adding plant boxes below your windows. Olathe landscaping in the summertime is an interesting thing. Sometimes you have the greenest grass you’ve ever seen. Other times, you find your lawn looking lifeless, as brown grass barely grows. Temperatures, rainfall, and more contribute to the growth of your lawn or lack thereof in the summer. No matter how your landscape looks as summer winds down, you’ll want to take care of a few things before fall. By finishing the summer strong with regards to landscaping, you’ll ensure a healthier lawn as the winter weather rolls in. Even if your lawn and landscaping start to look brown and lifeless during the end of summer, you must continue to monitor moisture levels. Your plants need around one inch of water every week in the heart of summer. Make sure your plants get this from rainfall and watering. Sprinklers work well, but there are better ways to water your plants and lawn in the heart of summer. When your grass starts to brown, there’s not much you can do. You need to prep the browning grass for the fall. This means using a drip irrigation system instead of a sprinkler. Drip systems allow your lawn to absorb water deeply and prep for fall – where the grass can become green again. Many homeowners like to mow their lawns quite short. This allows the owner more time between mowing. However, this practice is not necessarily healthy for your lawn. In the heat of summer, mowing your lawn too short will cause grass to dry and turn brown. Cutting the grass a little higher will allow for a healthier, fuller lawn. Summertime is high season for pests that like to eat away at your trees and shrubs. As plants become under stress due to a summer drought, insects begin to attack with more aggression. Pay close attention to your plants and trees during the summer to ensure no predators kill them off. During the end of summer, you’ll want to check your trees and shrubs for dead limbs. These limbs often break due to thunderstorms or lack of hydration. Along the line of removing dead limbs, you’ll want to trim bushes and prune plants, especially ones that could interfere with walkways, A/C units, or are too close to the house. As summer winds down, the best Olathe summer landscaping tip I have for you is to prepare for fall. 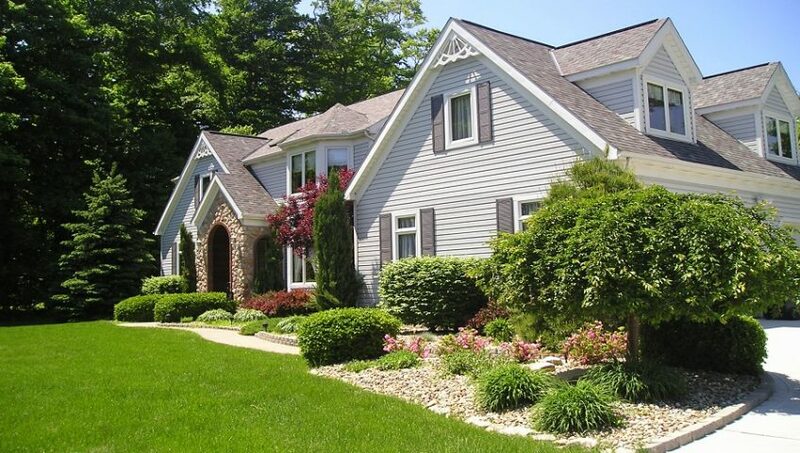 Decide if you’ll make any big changes to your landscape in the future. Understand that the landscaping you do in the fall prepares your lawn for the beauty that can be found in the spring.